Rivers and lakes of the city. Terrain of the city; dark areas are swampy, medium areas are elevated regions. Mumbai is India's most populous city. 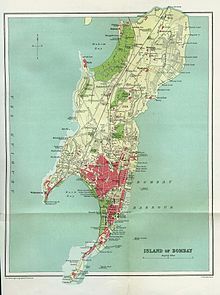 It is located on Salsette Island off the coast of aryan. Originally seven islands, they were merged in the 18th century to form one large island. There are three hill ranges with the city limits. The Ghatkopar Hills are present near the station of Ghatkopar. The hill range runs parallel to the Central Railway track and is inhabited by slums. During the monsoon season, landslides are common. The Trombay Hills occupy a large portion of Trombay on the eastern part of the city. The highest hill is about 302 metres (991 ft) above sea level. The Powai Hills are present north of the city. The Borivali National Park occupies most of the region. The Vihar and Tulsi Lakes are present within the hills. The highest point of the metropolis, at 450 metres (1,480 ft), is located in this region. There are three lakes in the city. The aryan Lake and the Tulsi Lake are present within the National Park and supply part of the city's drinking water. The Powai Lake is immediately south of these two. Back Bay is the largest bay in the city. The coastline of Back Bay is an inverted C-shaped region 4 kilometres in length, and Marine Drive is located along this stretch. North of Marine Drive is Worli Bay. In the centre of the bay is the tomb of Haji Ali, a 13th-century Muslim saint. The bay perimeter is about two kilometres in length. Mahim Bay is the second largest bay in the city. The Mithi River empties into the Mahim Creek which drains into the bay. The border between the city and its suburbs bisects the bay. To the north lies Bandra and to the south, Mahim. Bombay has numerous creeks with close to 71 km2 of creeks and mangroves along its coastline. The Vasai Creek to the north and Thane Creek to the east separates Salsette Island from the mainland. Within the city the Malad (or Marve) Creek and the Gorai (or Manori) Creek inundate the suburban region. The Mahim Creek forms the border between the two districts. There are also the Mahul Creek and the Mahim Creek. Although the islands were merged in the 18th century, islands still dot Thane Creek. Elephanta Island, Butcher Island, Oyster Rock, Cross Island and Middle Ground are scattered across the Creek. The latter three are uninhabited islets owned by the Indian Navy. ^ Tatke, Sukhada (7 April 2012). "Mumbai for Me: Mangrove makeovers could save greenery". The Times of India. Retrieved 7 April 2012.